So, you are starting to get your running mileage up a bit. That’s great. But now you have figured out that longer distances require more hydration. Handheld water bottles do a decent job, but sometimes the longest runs require you carry more water than what’s comfortable to hold in your hands. One solution is the hydration belt. These ingenious inventions can hold water bottles along with other important items like your cell phone or house key. This leaves your arms free while you run. To figure out which hydration belt best suits your needs, determine how much water and storage space you’ll need to carry while you run. 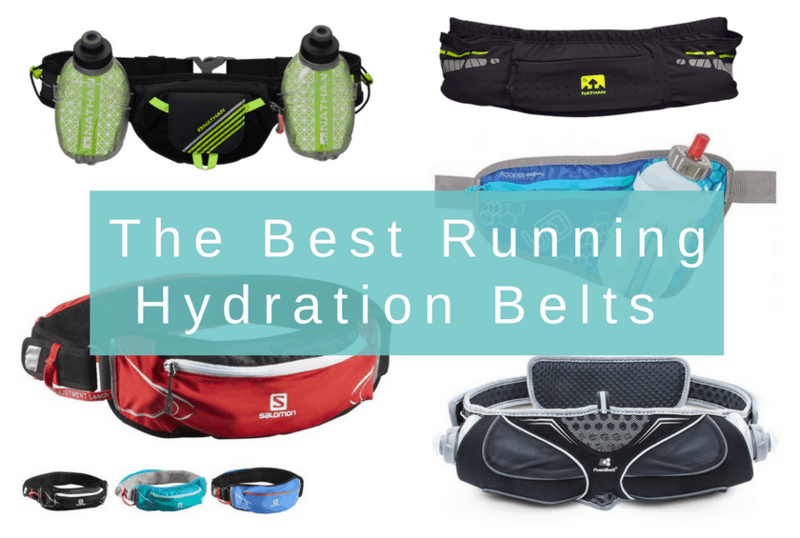 Once you figure that out, then you can pick from our list of 10 best running hydration belts. If you are not sure, the most popular water belts hold 20 oz of water (either one big bottle or two smaller ones) and have enough storage to carry a phone. But each water belt has unique features from insulated bottles to soft flasks to extra storage for jackets and gels. 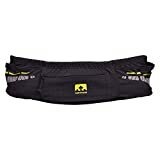 If you find yourself running hot weather climates, then the Nathan Sports Insulated Trail Mix Plus belt makes an excellent choice. It comes with two 10-ounce insulated Fire and Ice flasks that will keep water cooler for longer. The two flasks are held in their trademark SpeedFit holsters for easy one-handed access. And as its name implies, the water bottles won’t freeze in cold weather, either. If you find you need to carry other items with you on the run then the Trail Mix Plus has you covered. The front zippered pocket can handle a phone as large as the iPhone 7. It also has a secure pouch to keep your keys separate from other items such as gels and snacks. This belt is made from a soft monofilament material that allows for multi-directional stretching. This results in less bounce and a more ergonomic fit. 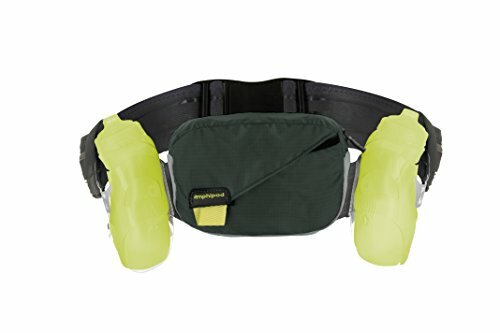 This hydration belt from Amphipod comes with a large pouch and two 10.5 ounce water bottles with Jet Squeeze tops. In addition to that, the belt is designed to be customizable. This means that you can add other options to make the belt do everything you need. The zippered front pouch is available in four different colors and is large enough to carry your iPhone. There is also a flap covered pocket to keep keys and other items separate from the larger pouch. The two pockets combine to give you ample storage for your longer runs. The bottles feature Jet Squeeze tops which allow for easy water access. 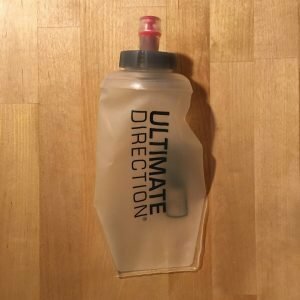 You can drink directly from the bottle without pulling or pushing the valve – all without sloshing or spilling while you run. The belt itself is designed to fit snugly to your hips to eliminate bouncing. This results in less chafing and a more comfortable run. The uniquely designed holsters also allow for one-handed grabbing of the water bottles. The Delaney model from Camelbak breaks away from the traditional dual holster approach. 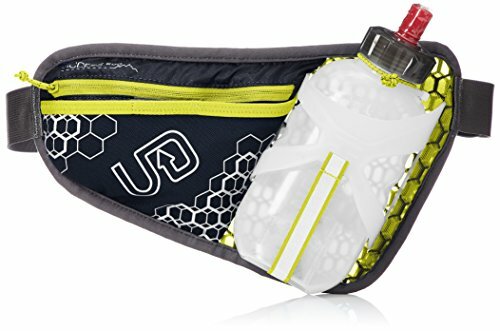 This hydration belt has opted for one waist mounted bottle with a 21-ounce capacity. The Podium Chill bottle is designed to keep your water colder for longer periods of time. There is a zippered phone pocket that is located for easy access. In addition to your phone, there is room to carry other essential items for your longer runs. This lightweight belt only weighs a mere 5 ounces. The belt is designed to keep the weight low on your body. The result is more stability and less bounce during your runs. The belt and the back panel are made from padded mesh that gives you a comfortable fit without chafing or hot spots. Using a combination of 4-way stretch nylon and MicroMono Mesh, the Ultra Belt 4.0 is a comfortable fitting belt that adapts well to different body types. The trademark MonoRip mesh back panel is designed to contour itself to your body, This results in a comfortable fit with no slipping or bouncing. The belt is designed with the bottle holsters and pocket in the rear back panel. The front of the belt maintains a lower profile to help distribute the weight lower on your body. This improves the overall stability of the belt. 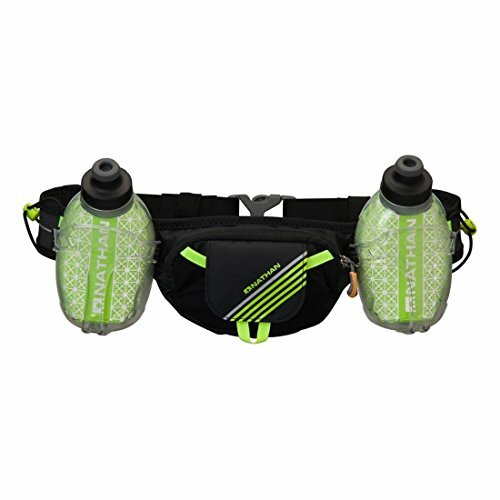 The holsters can hold two Body Bottle 500ml water flasks to provide a full liter of refreshment for your longer runs. Body bottles are soft flasks that mold to your body while your run, resulting in a super comfortable fit. Body bottles also collapse down in size when empty so the pack gets less bulky as you drink. The pouch can hold your phone, snacks, gels or other accessories. You can even add on an additional Adventure pocket to carry even more stuff for extremely long treks. 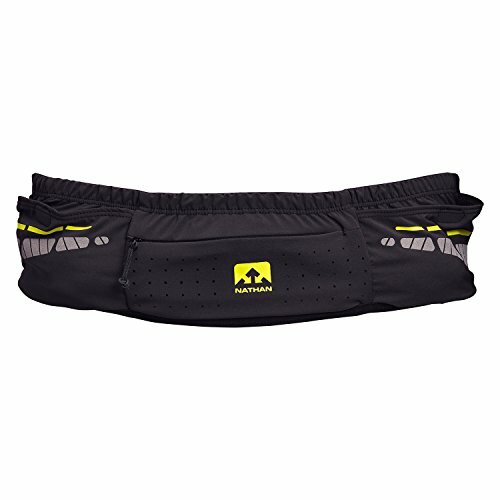 Nathan Sports partnered with well-known endurance runner Rob Krar on the design of this waist pack. Rob is a minimalist that prefers to wear no belt at all when possible. For longer runs, he worked with Nathan to design this lightweight belt to merge minimal size with maximum storage capacity. To help keep the size down, this waist pack comes with an 18-ounce soft flask. Rather than having bulky water bottles, the VaporKrar allows you to slide the soft flask into the waist belt. This keeps the belt snug to your waistline and doesn’t interfere with your running movements. The Nathan soft flask is unique in that it has a plastic skeleton inside the bottle to make it easier to hold. This allows it to keep it’s shape even when the bottle is low on fluids. The belt is designed as a step-through model as opposed to having a buckle or clasp. This improves the fit and eliminates and bounce or chafing. Even with its smaller capacity design, this waist pack is still capable of holding your phone along with a few smaller snacks. Salomon weighs in with their ultra-lightweight hydration belt for the minimalist runners of the world. This stretch fit belt is designed to conform to your waistline with a snug fit. This helps to eliminate sliding and improve stability. The soft flask slides easily into the zippered pocket for a secure, no-leak water supply. The flask can hold up to 8 ounces of liquid. It also comes with a front expandable pocket for additional storage of the items you need for a successful run. The belt is made of durable three-dimensional mesh that provides more cushioning and improved airflow. This makes the belt more comfortable and cooler to wear. It also comes with reflective material so that you will be more visible to traffic while running out on the open road. 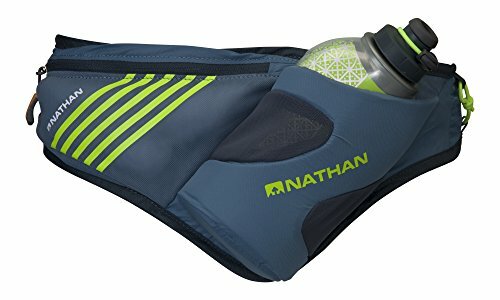 The Peak Waist Pack from Nathan Sports is another lightweight hydration belt that features one larger bottle instead of two. The 18-ounce flask fits in a conveniently angled holster that allows for easy one-handed access to much-needed water on longer runs. Nathan calls this angled holster system its Speed Draw. The bottle holder is also insulated. This helps keep your water colder for longer periods of time. This can be especially beneficial if you work out in warmer climates or are taking longer endurance runs. The zippered pocket will expand to keep your essentials safe and secure. The side panels have been extended to hug the contours of your body for a slip-free fit. 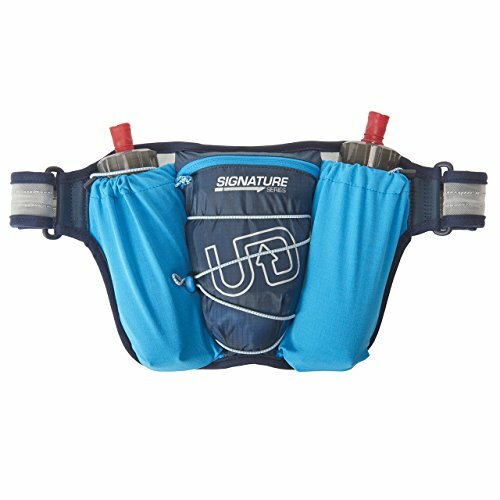 This hydration belt from Ultimate Direction is all about the ergonomics. The FlexForm 600 bottle holds ample amounts of water with its easy to grip shape. The bottle is held securely by the flex cage that slows for easy one-handed access while running. Made from Cool Wick air mesh, the Access 600 is designed for lightweight comfort and breathability. Weighing in at only 4.5 ounces without the water bottle, this belt offers a fair amount of storage without adding a lot of extra weight. The nylon pocket is capable of holding your iPhone 7 along with other items. The pocket is zippered for security but offers convenient access to snacks and other important items while you are on the go. The Fuel Belt is the first hydration belt on our list that actually offers a men’s and women’s version. Each one is defined to fit the specific physical needs of their specific gender. If you are in search of the ultimate in ergonomic design then you may have found it with the Fuel Belt. The belt has the capacity for two water bottles that contour to your body to eliminate bulk. The bottles are BPA free and dishwasher safe. This lightweight belt features Helium Hex material for improved airflow and better comfort. With gender specific designs, you will get a snug fit that virtually eliminates bouncing and slipping. This results in a comfortable run without chafing or discomfort. Another entry from Nathan Sports rounds out our list. 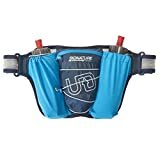 The tiny 10 ounces Swift plus Hydration belt is race ready and capable of carrying just the essentials for competition. The tiny bottle sits in an angled holster and features a push-pull cap for quick hydration. The zippered pocket will securely carry any gels, snacks or other essentials. It’s even large enough to hold your plus size cell phone. 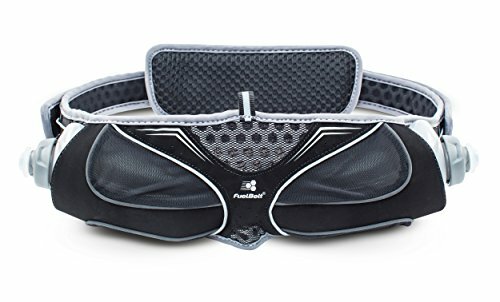 If you are shopping for a hydration running belt, you’ll quickly realize that the size and scope of the options are quite vast. Hydration belts – also called waist packs – carry various amounts of water from a lot to a little. They come with at least one but sometimes two or more bottles in different shapes and styles. And they have extra storage for bringing along extra gear on your run. We’ll review what factors to consider when shopping for a running hydration belt. Depending on where you run, what you are training for, and how far you go, the type of waist pack you should buy will vary. In the past, running hydration belts only came with hard water bottles. These were similar in size and shape to what you might buy for a bike or a stand-alone handheld bottle. And even today these types of bottles are still available and popular. Some are still tall and round in shape, holding 16-24 oz of fluid. But more often they are flat and rectangular with a 10-20 oz capacity. This shape allows them to sit better around the waist while still carrying roughly the same amount of liquid. 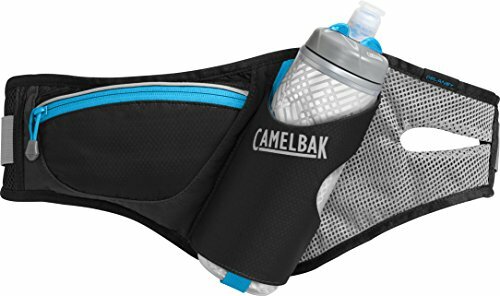 A few years ago, new waist packs came out with soft flask water bottles. These look and feel like a bladder or reservoir that you find in a hydration pack, but smaller with a valve to drink from. Soft flasks sit nicely around your waist. They are generally more comfortable to wear. There is less sloshing when you run, especially as you drink more from the bottles. They also collapse down when they are empty, unlike hard bottles. To drink, you bite down on the valve and squeeze fluids into your mouth. But there are two distinct disadvantages to soft flasks. The first is cost. Packs with soft flasks are more expensive. Sometimes as much as 25-40% more than a similar pack with hard bottles. If you are training for a one-time half or full marathon and don’t anticipate using your pack often, it may be more economical to buy a pack with hard bottles. The second is that soft flasks tend to hold less fluid than hard bottles. If you want to take along the most water, you’ll be able to hold a few more ounces in a pack than with hard bottles. Another factor to consider with bottles is whether they are insulated or not. This mainly applies to hard bottles as the soft flasks only come in one (non-insulated) option. Insulated bottles cost a little more; however, they’ll keep water and other fluids colder in the summer and help to prevent them from freezing in the winter. Otherwise, they basically look and hold the same amount of fluids as non-insulated bottles. The hydration belts themselves are also different. They come with insulated pouches to hold the bottles, adding another layer of insulation to the bottle and pack. In the summer, we like to throw the bottles in the freezer a few hours before a run. Take them out, add some ice, and your water stays nice and cool even on the hottest days. Bottles come with three types of valves to drink from. They all do their job, that is to get fluids from the bottle to your mouth. But how they do it varies and you may have a preference for one over another. A pull valve is your classic water bottle. Pull the top and the water flow opens so you can drink. Push it down and it stops. The pros are that these are simple and easy to use. The con is that if you forget to push the valve closed, water leaks out the top onto your waist pack and/or clothing. Bite valves always remain closed. Until you bite down on the soft, rubber valve while simultaneously squeezing the bottle. Unlike the pull valve, these won’t leak. But they can take getting used to if you’ve never tried them before. Some people don’t like having to bite down while you drink. Amphipod offers another style of valve called a jet valve. Like the bite valve, this won’t leak while you run. There is nothing to push or pull. But to drink water, you have to squeeze the bottle fairly hard until a strong blast of water squirts out. Some people have complained the water comes out too fast and shoots down their throat! Waist packs usually come with one or two bottles. FuelBelt does make some versions that come with 4-6 small bottles. The number of bottles you need will come down to how much fluid you want to carry as well as whether you want to bring two different types of hydration (like water and energy drink). 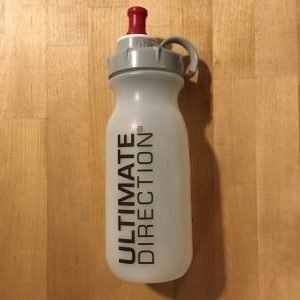 If you only need to carry water and don’t plan on doing runs in hot weather or going out for long runs, a small, single bottle should be sufficient. But for longer runs, or if you like to take two types of fluids, then two bottles are the way to go. FuelBelt’s 4-6 bottle packs are designed to evenly distribute a large quantity of water. Space the bottles evenly all around the waist pack and you should experience a smoother, less bouncy pack. This sounds good in theory but it also means you need to clean, manage, and keep track of extra bottles. One other consideration is that the more water you carry (like in waist packs with two large bottles), the heavier your load will be. If you like to stay light and nimble, you probably won’t want this much water. Besides carrying fluid, waist packs often have extra storage compartments to stash other gear. Some only have room for a few gels or keys. But other packs can hold a phone, headlamp – even a jacket strapped on with elastic cords. If you plan on bringing a lot of extra gear with you, look for a pack with added storage space.